B-MINCOME is a project that forms part of the EU’s Urban Innovative Actions programme. 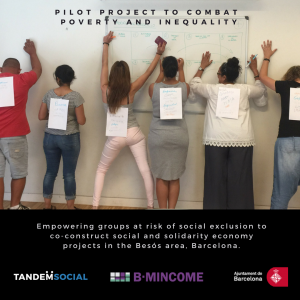 The project aims to test the efficiency and effectiveness of combining economic aid, in the form of Municipal Inclusion Support, with active social-employment policies in ten neighbourhoods in Barcelona’s Eix Besòs area. This is an innovative project that aims to invest directly in people while seeking to improve their immediate surroundings, their neighbourhoods and districts. In order to promote the social and cooperative economy, Tandem Social participates by introducing participants to transformative economies, training participants in concepts and skills related to the social and solidarity economy. As a part of these theoretical and practical sessions the participants grow their consciousness of and commitment to the environment and society. All these pieces form a part of a whole policy aiming to combat social exclusion.